It’s no secret that our favorite winery out in Sonoma is Buena Vista. 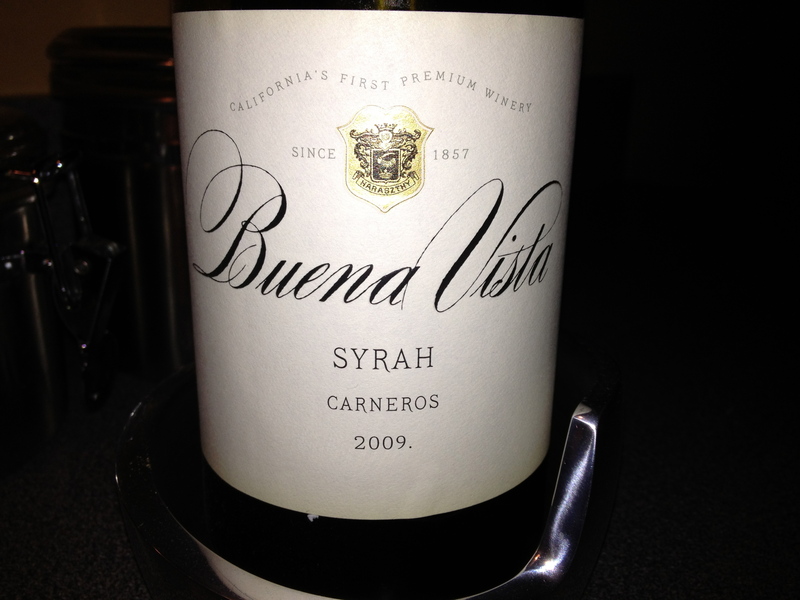 This syrah was one of their wine club selections that I was exciting to break out over the past week. In addition to providing a heart-healthy welcome home from work, it accompanied dinners that included 1) sushi, 2) a pork tenderloin with green beans and cous cous, and 3) chicken piccata with penne noodles in a white wine caper sauce. All were delicious regardless of what wine one was supposed to have with the fish, fowl, or pig in order to complement the various tastes involved. I’m sure finer and more experienced palates would offer a discerning analysis of this 2009 red…some pithy commentary regarding the bouquet, the nose, the fullness, and certainly the flavor. From our time in California I know this wine is possible due to the unique temperatures of the days and nights out in the Carneros region, and the vineyard’s proximity to the oceans and mountains alike. My taste buds simply offer a round of applause, and my eager hands reach for another glass. The wine club shipments typically include both reds and whites but I’m always more interested in the reds; this 2009 is worthy of that same legacy. This entry was posted in Syrah and tagged USA.